JMC Creations: Valentines Day Cookies! Figuring out crafty ways to decorate! Hello again! 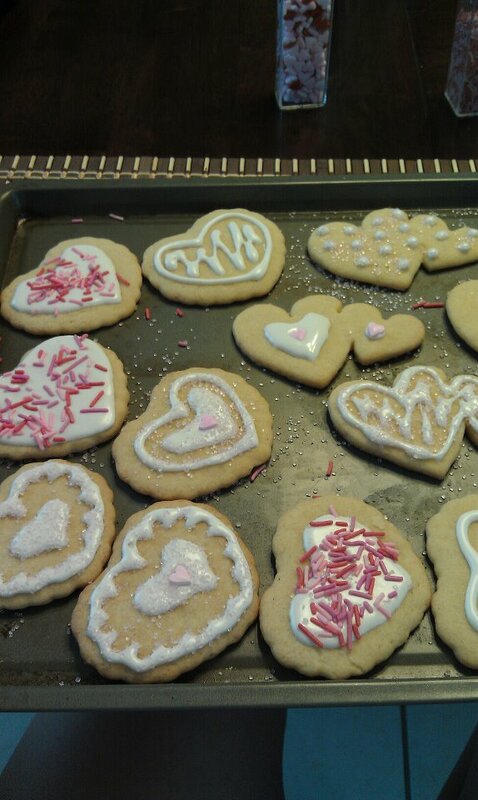 These are a little later than most posts for Valentines, but here are my sugar cookies that I made. I have realized that I love making these because I love being able to draw and make them cute and original. I just buy the package of sugar cookie mix and follow the instructions on the back. Then I get the little bags of the icing the gets hard after a couple of minutes. This stuff is amazing! It hardens so smooth and pretty! Here are the cookies I made. Sorry for the lack of pretty presentation. I love them and they are super Yummy! You're so creative. They look absolutely delicious. My name is Jamie. I was in the Air Force for 4 years and I am now going to school and working part-time. I want our house to be beautiful just like everyone else but need cheaper ways to do it. This is my journey on finding and making those things.